I have been playing around with the OPI Venice Collection, released for Fall/Winter 2015, over the past few weeks and have decided to do something a bit different from my more recent swatch parties. They take forever... I'm not sure how nail polish bloggers do them all the time! What I'll be doing instead is sharing some easy nail art inspired by the collection. My favourite colour from the OPI Venice Collection is It's A Piazza Cake so it was a natural first choice for me when it came to picking a colour. A persimmon creme, this orange shade is completely unique to my collection and just screams "Fall". Can't you just picture this being worn on cool, crisp days as your feet crunch through fallen leaves or as you prepare for Thanksgiving or Halloween festivities? As a creme, it also applies like a dream: super opaque in only 2 coats. The "glitter ombre" is a nail art look I do fairly often (see here and here, for example) but I don't think I have actually featured it on the blog before. I did write a tutorial on POPSUGAR though, so go check that out! It's so quick and easy to do. At the same time, I think it looks really cool and is a great way to spice up a plain mani. In addition to your base colour, you will need a glitter polish or top coat for the "glitter ombre" effect. 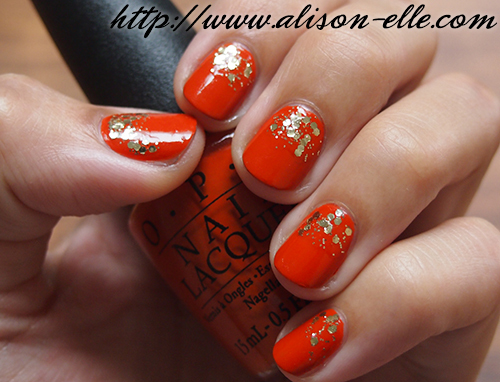 I initially tried to do this mani with Baroque... But Still Shopping!, which is a gold glitter released by OPI as a limited edition polish this season. Unfortunately it didn't work due to how dense it is (although this makes me pretty excited to wear it on its own). Instead, you'll need a glitter that is packed into a clear base. This way when you're painting the ombre, it won't affect the base colour. I personally prefer a glitter that has a mix of sizes as well. I used Avon Frosty 'N Fab Glitter Nail Enamel in Golden Tinsel above, which was a limited edition Christmas polish from a few years ago. It's a fairly common type of polish, however, so you should be able to find something similar. Some people do this look from the tip down, but I prefer my glitter based around my cuticles. It looks good either way... or you could even try a mix of both! I recommend patting the glitter down and of course, seal everything with a top coat since the glitter will add a bit of a chunky layer on top. Ta-da -- Fall-ready nails! These look gorgeous, I think I prefer it from the cuticles too! I swear by OPI Nail Envy but haven't tried any of their colours! Such a pretty combination! I think I normally do them from tip down but I want to try it from the cuticles! I have no idea how nail bloggers do it either! I'm trying to start a weekly mani type of series but I always forget to snap a photo of my nails and by the time I remember, it's chipped haha. These look amazing! I prefer the glitter from the cuticles too - but that's because I always seem to chip my nail polish within minutes of applying it! Love this color combo! 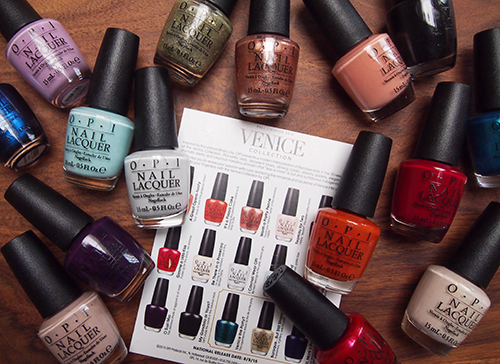 I love all OPI nail polishes. Even their names are fabulous! Oh no, I shouldn't have read this LOL! Now I want the entire collection! The red you are wearing with the gold glitter is stunning! I am loving bright reds and nudes this year.